In open outdoor areas, in private settings as well as in professional workshops or the catering sector – the IR 2050 provides cosy warmth everywhere: without the need for preheating, it distributes clean, non-condensing and odourless heat in an even and targeted manner. Seeing as the device gets by without fan, it supplies the heat without generating noise or raising dust, which makes it particularly suitable for allergy sufferers. The advantageous heat generation of this infrared radiator can be explained by the natural principle of the sun. The heat rays do not heat the air, but instead the solid materials and objects they are directed at. These store the thermal energy, which is later released in the form of secondary radiation. The device impresses with a heating capacity of 2,000 watts that can be set to 3 heating levels (750 W, 1,500 W, 2,000 W) – conveniently via an IR remote control if desired – thus covering a large heating range. Thanks to its 90° adjustable inclination angle, the heat source can be directed precisely at the target, e.g. a workbench or dining table. Soothing warmth combined with more pleasant light: Based on this premise, the radiant heater IR 2050 comes equipped with an innovative low-glare short-wave infrared tube. 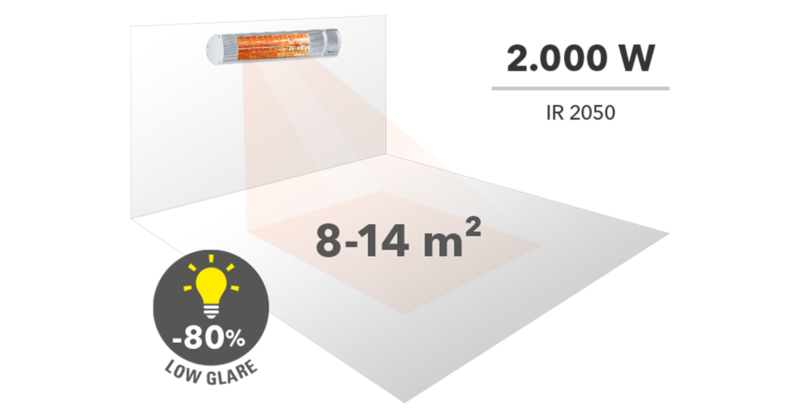 This innovation reduces the bright red light, which is frequently perceived as disturbing, by up to 80 % – while maintaining 100 % heat intensity. And best of all: The greatly reduced light radiation only affects the existing lighting concepts to a very little extent. With an average lifetime of up to 6,000 hours the IR 2050 emits pleasant warmth over several heating periods. The radiant heater has a slim and elegant design accommodated in an indestructible aluminium housing and is weather-resistant with IP65 protection – thanks to this construction, neither water or moisture nor dust can enter the housing of the IR 2050. This makes the IR radiators the perfect heat sources on open balconies and terraces, since they withstand rain from all sides. The IR 2050 heats up its direct surroundings quickly and economically. Seeing as it converts a great deal of the energy input into direct heat, the infrared emitter is particularly energy-efficient as compared to say hot air blowers. This is why it is perfectly suited as a standby heating solution, for it can be used in an ideal way wherever targeted heat is required. For start-up, simply plug the device's power cable into the nearest socket. If the infrared radiant heater is mounted on the wall or some other poorly accessible location, the remote control can be used to switch the device on or off comfortably. The IR 2050 is supplied in TÜV-tested quality, thus guaranteeing high value, safety and functionality and making sure that you are always on the safe side with Trotec brand quality. With a width of 630 mm and up to 2,000 watts of power the IR 2050 can provide infrared heat for many possible applications. Simply mount the infrared radiant heater to the wall. The device can be controlled conveniently via the remote control. The infrared radiant heater is equipped with an operating control lamp indicating whether the radiant heater is switched on. The steplessly adjustable radiator head can be tilted to an inclination angle of 90°. Infrared radiant heaters are available in many different versions for indoor and outdoor use. An important criterion for device selection is whether or not your radiant heater may be exposed to water or plenty of dust at its site of assembly or installation. If an infrared radiant heater is mounted in the bathroom, for instance, it operates at high humidity levels. Moreover, depending on the site of installation, water jets may reach the housing in some way or other. An infrared radiant heater installed on your terrace should be able to withstand occasional downpours. Heaters used in the workshop, however, should be protected against dust to a certain extent. The IP65 type of protection promises that no dust can enter the housing and that the radiant heater will withstand water jets from all sides. The robust design is suitable for both installation on balconies and terraces as well as use during winter sports events. Thanks to its dust protection you can also use these radiant heaters in industrial buildings with high dust concentrations. Ideal for the catering trade: Offer your guests warm seats on an outdoor terrace even in the time between seasons. Relax on a comfortable sun lounger by the hotel pool even on colder days. The IR 2050 is perfectly suited if you want to spend a good time in the open air during the time between seasons. With the infrared radiant heater IR 2050 your guests can enjoy soothing warmth between two ski runs. Whether outdoors, in a private setting or in a professional catering trade - the IR 2050 provides pleasant warmth everywhere: without pre-heating, even and targeted heat distribution is achieved. The infrared radiant heater IR 2000 S generates heat according to the natural principle of the sun. Thanks to 3 modern quartz heating rods and the 3 heating stages with 650, 1,300 and 2,000 W, it meets every requirement and can be precisely adjusted thanks to the adjustable angle of inclination. With 2,500 watts, the IR 2550 S provides for soothing warmth. The device can be used outdoors and thanks to the 90° angle of inclination, it can be aligned precisely. The IR remote can be used to switch the radiator on and off, select the heat settings, and control the 24-hour timer. The radiant heater IR 2010 impresses with all the convenient advantages of the IR series. These include the clean and condensation-free, odourless and noiseless production of cosy warmth as well as their even and targeted distribution without any preheating. The high-performance IRD 1200 tinted heat radiator successfully withstands the cold outdoors with its heating output of 1,200 watts. The IR remote control makes it easy to operate the 3 heat settings. The IRD 1800 produces clean, condensation-free, odourless and noiseless heat. Incidentally, without raising dust, so the device is also suitable for allergy sufferers.